Pet Kennels, Dog Runs For Sale! Looking for Pet Kennels in Phoenix that keep Predators OUT? 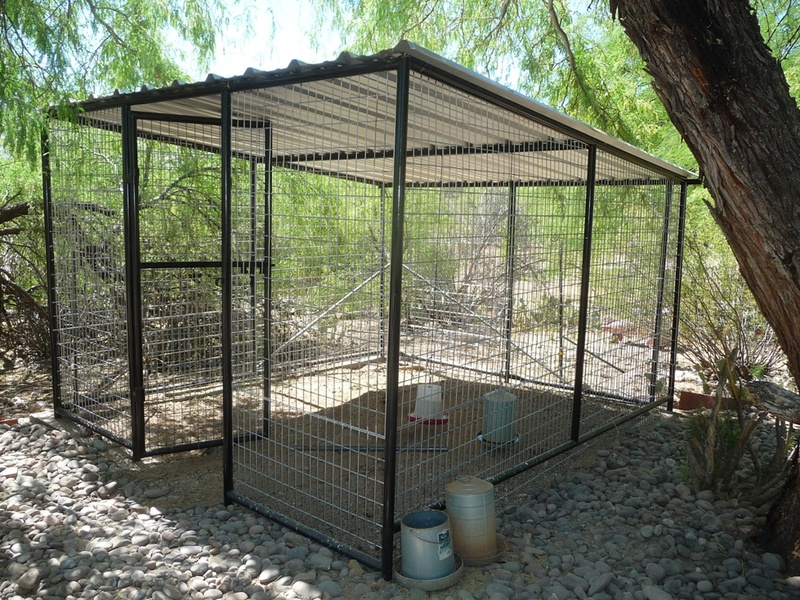 Let us build the perfect coyote proof containment system for your pets. We deliver to the entire Southern Arizona Area. 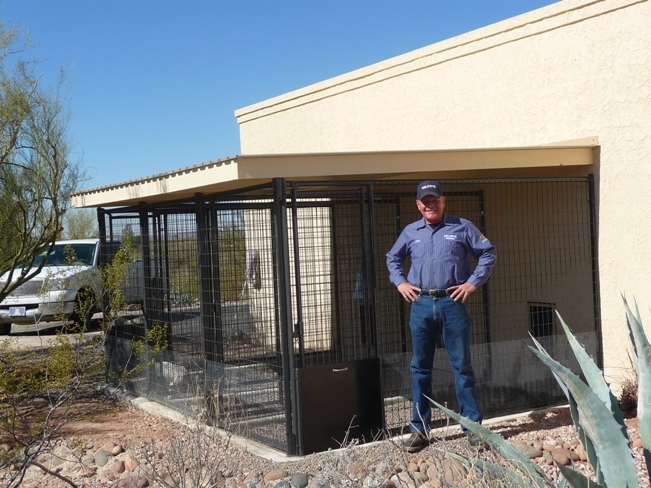 Custom Built Dog Kennels For Sale in Arizona  Animal Lovers looking for How To Build A Dog Kennel are at a disadvantage due to lack of information and resources. Often this will result in settling for a pet enclosure that is overpriced or unsatisfactory. We weld, fabricate, repair and install custom dog kennels for sale in Phoenix and all other areas of Southern Arizona. Click Here to see pictures and step by step instructions on building a kennel for dogs. This is accurate information and illustrations on "Do It Yourself Dog Kennels". 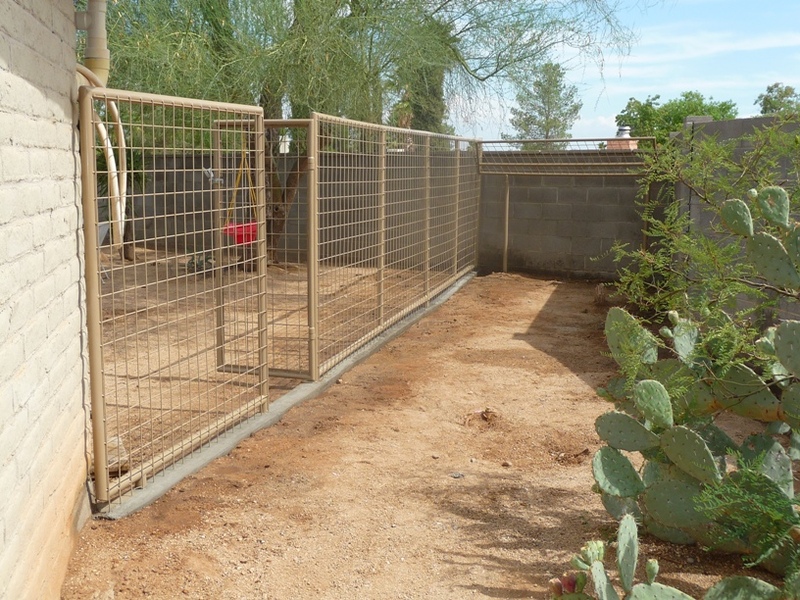 For years we sold and installed custom built animal fencing in AZ. We take pride in offering the Absolute Best Dog Kennels that you can find anywhere! You Won't Be Disappointed. Reclaim Your Yard, Avoid Injuries, Avoid Lawsuits, GUARANTEED To Be ESCAPE PROOF! Searching for a Large Aggressive Dog Kennel that is Heavy Duty in Arizona? You have found the right website. Enjoy the peace of mind knowing that your Aggessive Dog is safely housed in Arizona's Guaranteed strongest kennels. Fabricated from a welded 11 Gauge 1 1/2 inch steel frame set in 1 foot of concrete with 11 gauge 1 inch pickets. 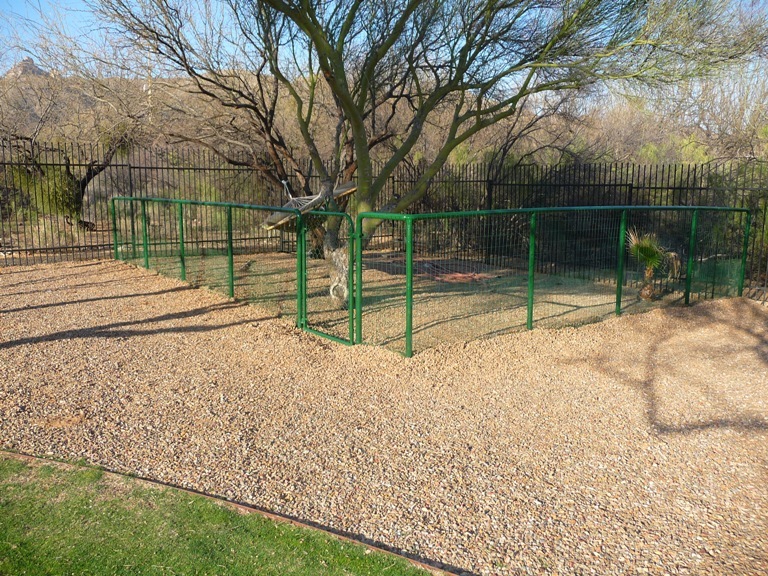 These Arizona Dog Kennels have been called Gorrilla Proof by those that have them installed. The Pima County Jail ain't got nothin on these babies. Consider the multitude of benefits offered by our Heavy Duty Large Aggressive Dog Kennels including knowing that your dogs can not be harmed, harm themselves or harm somebody resulting in a lawsuit. No More chasing a dog that escaped your backyard. No More paying bail to the local dog pound. Choose from galvanized steel or your choice of colors. 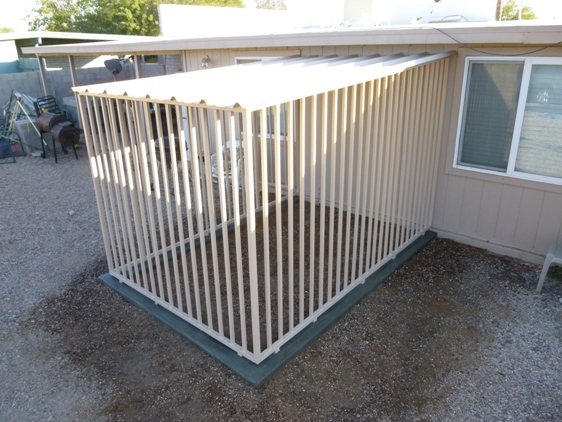 Our custom built Arizona dog kennels can even be painted to match the color of your house. We are also Arizona doggy door installers and a distributor of Hale Doggy Doors. Don't settle for pet store bought dog kennels in Arizona that are overpriced or unsatisfactory. The owner of the Aggressive Heavy Duty Dog Kennel on this webpage had bought 6 kennels that were all destroyed before he hired us to do thew job right. Arizona Kennel Installers For All Size Dogs, All Breeds, Problem Solved! Call Us For a FREE ESTIMATE. If Long Lasting Value, Durability, & Appearance Matter Call Us First.  Don't settle for pet store dog kennels that are made in China. This usually results in unsatisfactory enclosures that are overpriced, poorly made and will not last. We are endorsed by many satisfied clients on Angies List.com and other websites. We have been the Premier Dog Kennel Installers in Arizona since 1996. We can custom build animal enclosures and shelters that will meet any taste or budget. 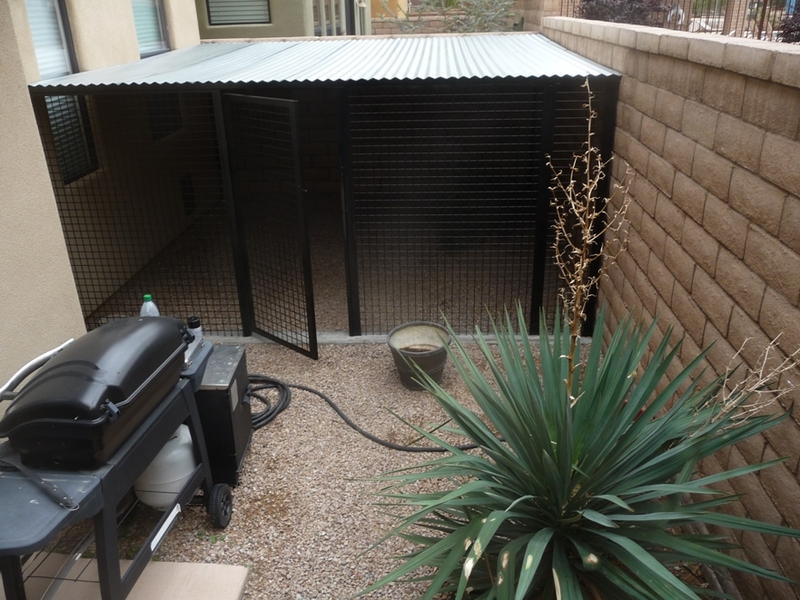 For years we sold and installed custom built kennels for dogs in AZ. We take pride in offering the Absolute Best Dog Kennels that you can find anywhere! You Won't Be Disappointed. 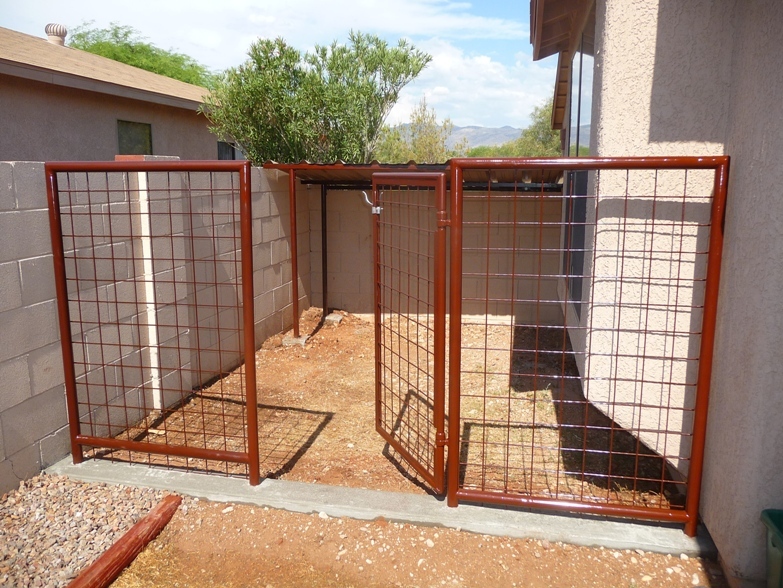 Dog Run Installation  Strong, Durable, Dog Kennels & Runs For Sale and installed in Southern Arizona. Easy to maintain, with FREE DELIVERY to All Areas of Phoenix. All dog kennels and run panels are available in rust resistant galvanized steel with chainlink, black powder-coated, or welded wire with your choice of colors. All work will be completed in a substantial workmanlike manner as according to your specifications. The pictures of dog runs on the left side of this page are constructed with hunter green welded wire on two sides. AGGRESIVE DOGS May Require One of Our Commercial Grade Dog Enclosures for sale. We can install many different kinds of pet containment systems such as dog runs and kennels with a concrete footer, snake-proof wire attached to your pet fencing and burried 2 inches under the ground to prevent your dog from digging and more. We can also install invisible underground dog fence. Since all dog runs are different please call us for pricing and we will be happy to come out and give you an estimate and discuss with you the many different options and prices that will fit your budget. Heavy Duty Pet Fencing & Containment.  Durable 2 Inch Pipe Dog Runs for sale in Southern Arizona. Tired of your dogs tracking in mud? OK Corrals can deliver and set up a dog run utilizing small round river rock that can be hosed down to leave a sanitary surface. Your dogs WILL NOT track mud in the house any more! We can also install artificial turf that has a porous backing with drain holes. The same quality product is used for our school, athletic field and lawn applications, all which resemble real grass. The surface is in filled with crumbed rubber to keep the turf fibers standing upright and to increase stability, creating a weighted surface which looks beautiful year round. It can be cleaned with Simple Green to disinfect along with a leaf blower and rake to remove debris. The fibers are water resistant and our technicians are trained to install your new dog run, pet fencing, yard, or kennel for sale with proper drainage and seaming where necessary. Strong Durable Kennels For Dogs Installed In AZ.  Durable Schedule 40 Two Inch Pipe with Large 6 Gauge Welded Wire Sides & Top makes an ESCAPE PROOF DOG KENNEL! Tired of your dogs getting out of the yard while you are at work? OK Corrals can custom build the perfect size dog kennel with fast installation! Custom Built Dog Shelters & Kennels For Townhouses & Small Yards.  If you live where there is a Home Owners Association (HOA) we customize shelters and kennels for dogs that will comply with Any and All rules and regulations set forth by your HOA. This dog kennel was installed with a roof to match the existing roof on these new townhomes built in the foothills. As you can see the kennel roof is installed just below the fence line so that it is not visable to the neighbors and complies with HOA rules. Commercial Grade Dog Runs and Kennels custom built & installed to your specifications. Made In Phoenix Arizona with USA Steel! Need A Small Dog Kennel? Custom Built Dog Kennels Made In Arizona! Best Quality! Made In Phoenix Free Delivery & Installation! Pet Lovers looking for dog runs and kennels in Southern Arizona are at a disadvantage due to lack of time and resources. Often this will result in settling for a product that is overpriced or unsatisfactory. 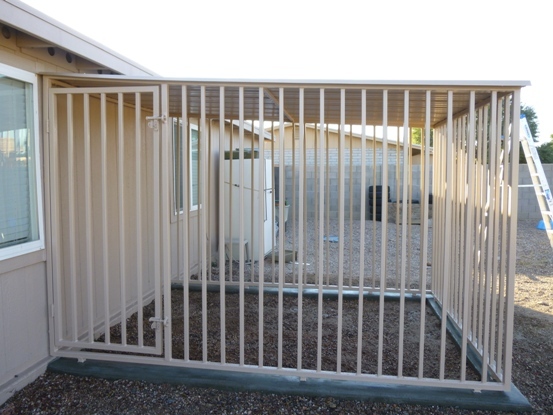 For years we have consistantly provided quality steel dog runs and kennels at the lowest prices in Phoenix and the surrounding areas. This website offers a . Every day we build and deliver The Most in AZ. For years we have fabricated thousands of and delivered to all areas of Southern Arizona. We take pride in offering the Absolute Best Products at the Lowest Prices that you can find anywhere! You Won't Be Disappointed. We also build . Whether you are seeking a dog run or kennel in Southern Arizona. You will find better selection and quality at the lowest prices by contacting us for a free estimate anytime night or day and see how easy finding a home for your pet can be. 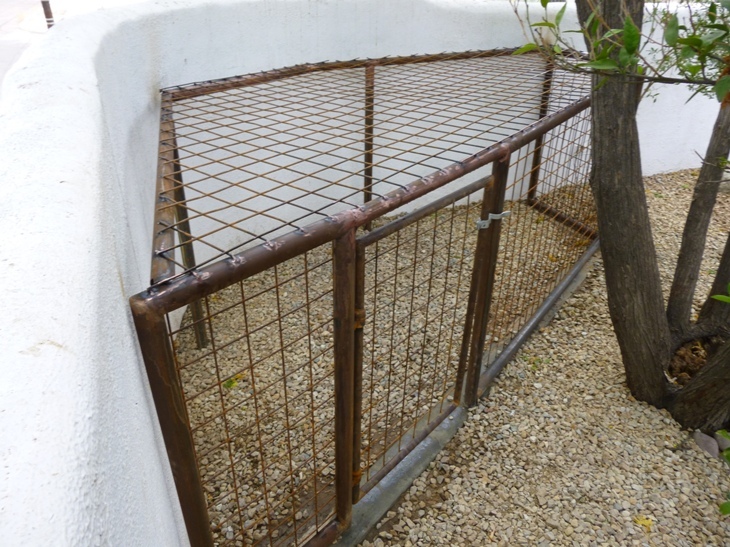 All kennels and dog runs are made with the best quality steel, have full details, complete instuctions, and a guarantee. We cover all areas of Southern Arizona. We kennels in stock that are available now or will build custom dog runs and kennels delivered within 2 weeks. Take time to bookmark this website to get information on sales and specials. Many of our dog runs and kennels are Exclusive and can not be found elsewhere. We also custom build many types of pet feeders, sheds, fencing, Save your Gas and Time by viewing pictures of our animal kennels for sale that you see on our website so you are not wasting time driving around looking at unsuitable products. 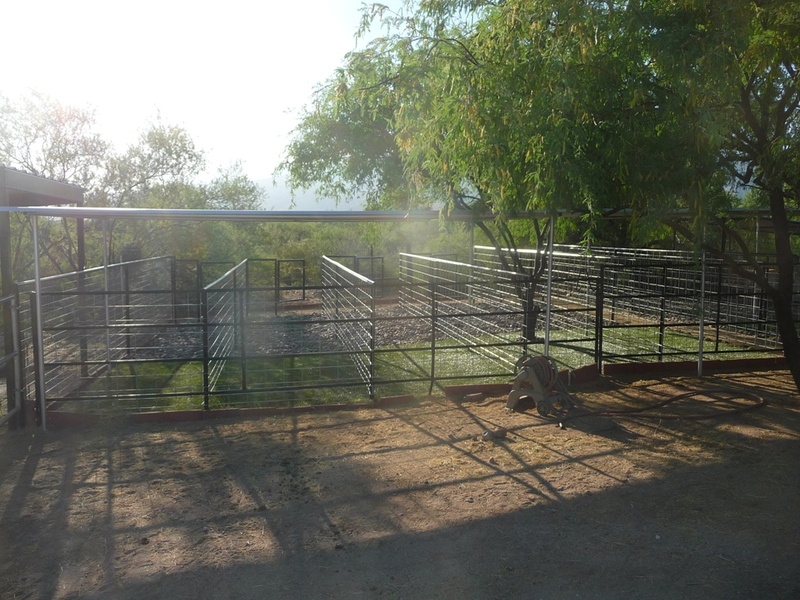 Choose from available canine kennels, k-9 fencing, and k-nine products for sale in Southern AZ. YOU ARE ALREADY BUSY ENOUGH! and YOU'RE DONE! Relax! Enjoy Arizona! Bird Dog Kennels In Vail AZ. Hunting Dog Breeders In Phoenix AZ. Gun Dog Breeders In Phoenix AZ. AN Arizona Family Owned Company Since 1996 .